The CognitiveTPG EZ-LP has been discontinued. No direct replacement is available. Keep your Code. Choose your Printer. The CognitiveTPG EZ-LP desktop printer is your alternative to more expensive legacy printers, providing a better value with drop-in compatibility. 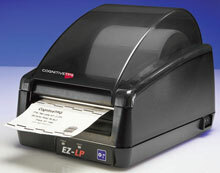 The EZ-LP is a 4" wide direct thermal printer that comes standard with a durable print mechanism, extensive flash memory, 5" media roll capacity and multiple communication interface options and programming emulations. The EZ-LP is ideal for a wide range of applications, including work-in-process (WIP), logistics, and retail. 2.3" x 1" Direct thermal paper label. 1,685 labels/roll, 12 roll case. 4.25" x 1" Direct thermal paper label. 1,685 labels/roll, 12 roll case. 2.4 " x 1" Direct thermal vinyl label. 1,685 labels/roll, 12 roll case. 2.3" x 1" Direct thermal paper label. Black mark. 1,685 labels/roll, 12 roll case. for Barcode Blazer Printers. 4.25" x 6" Direct thermal paper label. Black mark. 323 labels/roll, 12 roll case. 4.25" x 458' Black Wax-Resin Ribbon, Compatible with Desktop printers and Polypropylene Labels, rolls/case: 12, Core Size: 0.5"